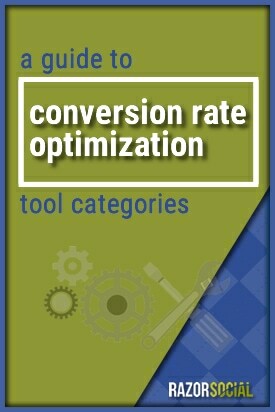 I was looking for a post on Conversion Rate Optimization tool categories and I couldn’t find a good one so I decided to create one for you!!!!! Conversion Rate Optimization (CRO) is one of the key practices that every marketer needs to master. Since every conversion represents either direct or future revenue, increasing conversion rate is a fool-proof method to maximize your website ROI and drive business growth. CRO allows us to get more value from the traffic we’re already getting, so it makes perfect sense to invest more time and resources into it. We have created the following infographic highlighting 9 Conversion Rate Optimization tool categories that will make your optimization efforts a lot easier and help you improve your conversion online. Capturing leads through your website is crucial for building your email list. It is the foundation you need to start building relationships with your prospects and gradually move them further down the sales funnel. If you want to streamline the process for converting visitors into leads, you need to ensure that your lead capture forms are optimized for the users. To do this more efficiently, try using one of the following tools. OptinMonster – With over 300k websites using it, OptinMonster is probably the most popular tool for generating more leads and growing email lists. It is packed with useful features such as custom opt-in forms (customize colors, fonts, backgrounds, etc. ), A/B testing, page level targeting, mobile-specific popups, and analytics that show you how well your forms are performing. It also features the “exit intent” technology so you can show a popup optin to users who are about to exit your website. This is a very efficient way to re-engage your visitors and ramp up your website’s conversions. Thrive Leads – If you’re running a WordPress site (Optinmonster supports more than WordPress) Thrive Leads is a plugin that can help with your lead generation efforts. It offers different types of optin forms and an easy to use drag-and-drop form builder. ThriveLeads has a targeting feature that lets you show the most relevant offers to your visitors based on specific posts, categories, tags, and more. It also supports A/B testing of different optin types against each other. SumoMe – Another WordPress plugin which is very useful for list building and lead generation. It lets you create popup forms, scroll boxes, floating bars, and CTA popups that cover the entire screen. With the Pro Pack you get A/B testing, pro insights, advanced configuration options, and access to pro templates. WPForms – WPForms is a drag and drop form builder for WordPress. It’s promoted as the most beginner-friendly tool of its kind available in the market, and for a good reason. It’s feature-rich, yet pretty easy to use. It comes with a library of nicely designed form templates to get you started, and the forms you build will work equally well on desktop and mobile. A nice feature is Instant Notifications which help you reply quickly to your leads. You can also integrate your WordPress forms with an email marketing service, such as MailChimp, or collect payments through integration with PayPal. Formstack – This is a great tool for building any type of online forms, including contact forms, newsletter sign-up, event registration forms, surveys, etc. Formstack comes with an easy to use online form builder which allows you to create forms and customize the design in minutes without the help of developers. Similarly to other tools in this category, it supports A/B testing and offers analytics. The main differentiator is the 40+ available integrations including the most popular CRM systems, email providers, payment platforms, etc. Hello Bar – This tool displays a bar across the top of your page that you can use to capture leads. It’s a great way to direct your visitors’ attention towards your website’s primary call to action. Hello Bar integrates with Aweber, Mail Chimp, and Campaign Monitor. Having an analytics tool in place is probably the most important part of planning and evaluating your CRO efforts. These tools will give you the necessary insight into your visitors’ behavior and help you identify the poor performing elements of your web pages. You need to be able to look at the basic metrics, such as bounce rate, exit rate, etc. but also to perform a more advanced analysis to track conversions, look at different audience segments, etc. At the most basic level, you can use Google Analytics to identify pages with high bounce rates, poor “stickiness”, etc. and then work on fixing those issues. But the real value it brings to the Conversion Rate Optimization process is the ability to set up conversion goals and funnels so you can effectively track and optimize conversions on your website. Kissmetrics – Kissmetrics lets you track important conversion metrics, including first-time visitor conversions, return visitor conversions, as well as the visitor’s’ behavior on the site. The best thing about this tools is that you can map out the typical steps your users take from first coming to your website to completing the conversion goal you’ve set. When you set up your funnel and your conversion goal, you’ll also be able to see a nice visual report of the data you’ve been gathering. Clicktale – Clicktale lets you record visitors’ sessions and provides you with insight into their behavior and intent. With this tool, you can also generate heatmaps and clickmaps which are great visualizations of user behavior on your site. You can then use this knowledge to make strategic optimizations to encourage your users to convert. StatCounter –This tool is great for tracking all visitors to your site, both first-time and returning. It gives you very detailed stats of individual visitors so you can target them with customized content and offers. With StatCounter, you can also see the navigation path visitors took through your site so you can find potential issues and optimize accordingly. Mixpanel – Mixpanel enables you to analyze visitors’ actions on your mobile or web application by tracking specific events. This platform also lets you build your funnel and track how users are moving through it so you can pinpoint any points of friction and fix them. Clicky – Alternative to Google Analytics, Clicky offers real-time web analytics and provides a very detailed report on every segment of your website visitors. It also lets you analyze each individual visitor and the actions they take on your website. You can choose to view heatmaps for individual visitor sessions, or only for visitors who completed a specific goal. User research tools allow you to understand how users interact with your website. You can use them to discover if there are any bottlenecks, navigation issues, or confusing elements on your pages that prevent users from achieving your conversion goals. By fixing these problem areas you can tremendously increase your conversion rate. Crazy Egg – A Visual Website Analytics tool designed mainly for conversion optimization. CrazyEgg offers many great features to help you better understand your visitor’s behavior. With Crazy Egg heat map, you will be able to see where your visitors are clicking most, and a scroll map will show you how far down the page they are scrolling. You can also get an overlay report to see how many times a visitor clicked on a particular page element. Probably the best feature that this tool has to offer is Confetti. You can use it to segment all the clicks on your site based on a date of visit, referral source, search terms, and more. CrazyEgg is quite easy to set up – you just add the CrazyEgg code to the pages that you want to track and it will start tracking all clicks on those pages. Hotjar – If you’re looking for a tool that brings together user analytics and feedback, Hotjar is a great choice. It offers heatmaps and visitor recordings and allows you to test your funnels to find opportunities for improvement. The great thing about the visitor recordings feature is that you can watch recordings based on a specific user ID, device, or location. With Hotjar, you’ll also be able to create feedback polls and surveys to get insights from your visitors at the time they convert, or just before they drop off. Needless to say, this information will be immensely valuable for your CRO efforts. Lucky Orange – Lucky Orange is a Conversion Rate Optimization tool that records visitors on your website showing you potential reasons why they didn’t convert. It offers recordings, heatmaps, chat, conversion funnels, form analytics, and polls as part of their suite. Through your dashboard, you can filter and segment recordings to see exactly where visitors are dropping off and why. Quarloo – Qualaroo is a Voice of the Customer Tool that can help you capture important customer feedback. It lets you create short and simple surveys, select on which pages you want the survey to be displayed, and even define specific triggers for the survey. For example, you can choose to show your survey only to visitors who have visited at least 5 pages on your website. Inspectlet – If you want to find out what users are doing on your website, but also understand the WHY behind their actions, Inspectlet is the right tool for the job. Main features include Session Recordings, Heatmaps and Form Analytics. The tool records videos of user sessions allowing you to see their every mouse movement, scroll, and click. By understanding how users interact with your site, what’s distracting them, and what’s attracting their attention, you can significantly increase your conversion rate. MouseFlow – Like Inspectlet, Mouseflow is a user behavior tracking tool. It provides session recordings and heatmaps that show exactly what users are doing on your website e.g their clicks, scrolls, mouse movements, etc. Funnels is a very useful feature of this tool that lets you see where visitors are dropping off in your funnel. In addition, if you want to get direct user feedback, you can use MouseFlow to create custom surveys and target a very specific audience. If you’re really serious about CRO, you’ll want to focus on improving the ability of every page on your website to convert traffic. No matter if the end goal is micro or macro conversion, a page needs to “work” towards that goal. Sometimes, making a seemingly small change on a page can significantly impact your conversion. The key to discovering which pages or page elements will lead to higher conversion rates lies in continuous testing. And when it comes to building and/or testing landing pages, the following tools can be of great help. Optimizely – This is a very popular and user-friendly A/B testing tool that you can use to test two variations of a page to see which one performs better. You can easily create new or make changes to an existing page with a simple editor, without having to change the underlying code of the page. Optimizely also supports multivariate testing, meaning that you can test multiple variables on a web page. Another great thing about this tool is that you can test your new pages with specific audiences by targeting different browsers, locations, etc. Visual Website Optimizer – VWO is an easy-to-use A/B and multivariate testing tool that lets you create tests and have them live in minutes. All you need to do to start testing is to point the tool to a specific URL and it will capture that page so you can immediately start making variations of that page. With the VWO editor, you can edit and remove any element on your page and test everything from copy to images and design. VWO will let you see not only which page performed better, but also which specific changes that you made increased conversion. LeadPages – We like to use LeadPages because it allows us to create high converting landing pages in minutes. You can choose from a gallery of 65 mobile-optimized templates that are proven to convert well. There are different types of landing page templates available, including those for eBook downloads, webinar signups, etc. You can easily set up A/B testing and measure conversion on each page. LeadPages also integrates with Aweber, MailChimp, InfusionSoft, and many other email marketing and marketing automation tools. Unbounce – Unbounce is another tool that makes it simple to create and test landing pages even if you have no HTML knowledge whatsoever. There are pre-made templates available and a drag and drop editor that lets you create customized landing pages in minutes. Additionally, Unbounce makes it easy to run A/B tests and optimize your pages for conversion. They recently added a new feature called Convertables which lets you launch targeted overlays with a dedicated CTA on top of any page. You can also use targeting filters to show your offers to the right audience which can have a great impact your conversion rates. Instapage – With Instapage you can quickly build landing pages with the help of 100+ mobile-optimized templates. The tool offers templates for different scenarios, including lead generation, webinar signup, mobile app introduction, and more. Of course, there’s an A/B testing tool that lets you track visitor behavior clicks, form submissions, etc. ), compare conversion rates between two variants of a page, and choose the best performing one. Poor website performance can have a very negative impact on conversion rates. Research shows that loading time longer than 3 seconds decreases the opportunity for conversion by around 40%. This is a very good reason to regularly check your website performance and fix any potential issues. GT Metrix – GT Metrix is a great tool for testing your page speed. It also gives you information on how you can improve your website’s speed and performance, all based on test results. Pingdom – Pingdom is a free Website Speed Test tool that returns some really valuable performance insights. You simply enter your URL and start the test. The tool will generate a report which includes your website’s Performance Grade, load time, and also gives you suggestions for optimizing your website performance. Webpagetest – This tool is similar to Pingdom. You can select the country from which you are running test, as well as the browser. This gives you an option to see how your page performs from different locations around the world. Did you know that 2 out of 3 people leave the checkout pages on e-commerce websites without making a purchase? That’s 70 % customers that abandon their shopping carts! If you’re looking to improve these statistics for your web page, you need to identify weak spots in your conversion funnel or any elements that are distracting visitors from converting. To make this process easier, try using one of the following tools. Thrivecart – Thrivecart is a very simple tool for checkout page optimization. You can quickly build your checkout pages by choosing from a number of professionally designed templates. More importantly, you can use Thrivecart to create 1-click upsells, build funnels, perform A/B tests, and much more. It integrates with all relevant email marketing and automation tools, including MailChimp, Infusionsoft, GetResponse, and others. Samcart – Creating checkout pages with Samcart is an effortless process. You can use their pre-built checkout pages and then customize them to match your website. The tool allows you to sell one-time products, recurring subscriptions, payment plans, and more. It also features an analytics dashboard with metrics such as churn rate, which is very important to track if you want to optimize your checkout pages for higher conversion. Research shows that companies that use marketing automation to generate leads have a 53% higher conversion rate on average. Below are some of the tools that we’ve tested that could help you automate a variety of marketing tasks and increase your conversion rates. Ontraport – Ontraport is packed with powerful features that let you automate a wide range of marketing tasks. You can use it to automate your email campaigns, quickly create and test email capture landing pages, or for functions like lead scoring, task management, and much more. It also has rich shopping cart functionality that lets you easily set up and customize your shopping cart, automatically collect credit card payments, show upsell and cross-sell offers, or set up cart abandonment sequences. Infusionsoft – InfusionSoft is probably the most popular marketing automation tool for small businesses. It provides CRM, email marketing, lead capture and e-commerce automation bundled into one platform. Infusionsoft CRM enables you to manage your contact by tags, set your lead score, and build email subscriber profiles. All these CRM options can help you deliver your content and offers to the people who want to buy from you at the right time, increasing your conversions. You can also create email sequences and set up triggers to send personalized messages based on email opens, clicks, form submissions, and more. On top of this, there are over 300 apps and integrations in their marketplace, enabling you to connect Infusionsoft with a wide variety of tools. ConvertKit – ConvertKit is an intuitive and easy to use email marketing automation tool aimed at bloggers and other businesses looking to grow their audiences. Even if you are a complete beginner and you’ve never created an email sequence before, you’ll find it quite easy to start with ConvertKit. The tool provides very nice templates and a series of email drafts that you can use and customize. With ConvertKit, you can create forms and landing pages for collecting leads, create email sequences and send them at particular time and date, send emails triggered by user activity, and more. ActiveCampaign – ActiveCampaign is a complete email marketing automation and CRM platform. It features a visual automation editor that makes it very easy to create email workflows. The tool supports email list segmentation (by tags) which is incredibly important for sending highly targeted, high converting emails. ActiveCampaign integrates with over 150 different tools via their Zapier integration. Drip from LeadPages – Drip is a feature-rich marketing automation and email platform. It delivers the majority of features and benefits of other tools in its category while being much more affordable. Drip offers a visual campaign builder that you can use to design email campaigns based on your subscribers’ actions, decisions, goals, etc., which ensures that you’re sending the right email message at the right time. You can also create automated sequences of emails, which are called Campaigns in Drip. There are pre-built templates for campaigns that you can use, or you can create your own email sequence from scratch. Drip also integrates with TONS of other popular products, including lead generation ones like LeadPages, Shopify, and SumoMe. When optimizing your paid search and social ads for website conversions, testing becomes the not so secret ingredient to success. It takes time and effort to get your ad campaigns right, and testing allows you to learn which targeting and ad creative perform best. Ad optimization via ad management tools in social platforms, e.g. Facebook’s Power Editor, can be quite complex, and there are tools that make this process much smoother. AdEspresso – AdEspresso is a tool for creating and optimizing Facebook ads. It is more powerful than the Power Editor and less complex. The tool lets you easily set up and test different variations of your ad. It can automatically test different images, headlines, ad copy, etc. AdEspresso also provides an analytics tool that helps you understand all relevant campaign metrics, and it gives you suggestions on how to optimize them. AdEspresso looks at the results of your campaign, and with the help of their proprietary algorithm, it gives you suggestions to reduce your PPC. QWaya – Not as simple or visual as AdEspresso, but still an excellent platform for creating, publishing, and optimizing Facebook ad campaigns. With QWaya you can split test every element of your ads, including headlines, copy, link descriptions, and images. This helps you identify the winning combinations and optimize your campaigns. It also integrates with Google Analytics so you can see conversions attributed to your ads in Qwaya. Adstage. io – AdStage is really useful if you’re running ad campaigns on multiple social networks. It allows you to create and optimize ads with Facebook, Twitter, LinkedIn, Google Adwords, and Bing ads. The tool lets you compare performance figures within one report, so you can easily see which campaigns on which networks are underperforming. You can then pause poor converting campaigns and increase your spend on those that are bringing you good results. Funnel.io – Funnel brings the data from all your advertising platforms into one place and connects it with your conversion data. This process is automated which saves you A LOT of time. The data is also presented in a straightforward way so you can quickly generate and share your reports. Funnel offers an API that connects your advertising data to your internal BI systems. Funnel optimization is the process of measuring and optimizing the steps your customers are taking on your website to accomplish a conversion goal. No matter how many steps your conversion funnel has, it will usually have one goal – a product purchase, eBook download, signup, etc. In order to optimize the funnel, you’ll need to understand where you are losing potential customers. You need to identify the so-called drop off points and make improvements by figuring out what’s causing the customers to drop off. This is not a one-time activity, but a process that takes time. Using one of the funnel optimization tools can help you be more efficient at it. Click Funnels – If you want to avoid relying on developers when building your conversion funnel, try this platform. With ClickFunnels, you can create different types of marketing funnels in minutes. All you need to do to start is pick one of the readymade funnel types, such as Product Launch Funnel, Webinar Funnel, Lead Capture Funnel, etc. They are pre-filled with generic copy but you can easily edit all pages and fill them with new content. ClickFunnels also helps you track how each page in your funnel performs. It features an analytics dashboard which shows you the total number of visitors for each page in the funnel, how many visitors clicked on the next button of the page, and the conversion rate. Split testing is also supported which is important for helping you optimize the conversion rate of your funnels. Conversionfly – Conversionfly has many exciting features. Besides complete funnel tracking and reporting, it also tracks individual customer’s journey through your campaigns. With Conversionfly you can identify funnel leaks by traffic source and start optimizing them to increase performance. Each of these tools comes with its own set of advantages. The best way to decide which ones to use is to try them (some of the tools are free, and others have free trials) and see what really works for your websites. So keep testing and analyzing to optimize your website and you’ll create a perfect toolbox to fit your needs during the process. What are some of your favorite conversion rate optimization tools? How many of the tools we’ve listed do you use?